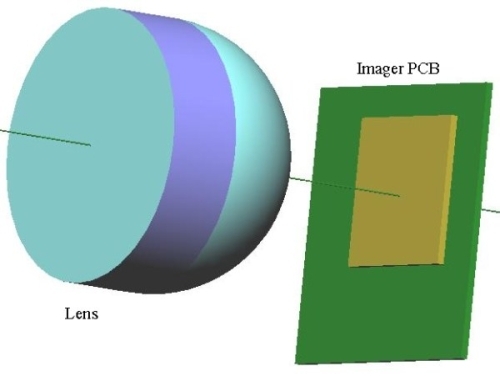 Thermal effects can reduce the quality of an optical image, and should therefore be considered in the design process. Thermal changes may affect the focusing as well as positioning drifts that may cause a boresight error. In the following discussion we exemplify one method to athermalize a simple PCX lens. c)	The housing to expand with temperature – causing the image distance to the focal plane to increase, thus tending to cancel out the effects of a and b.
d)	The distance between the lens’ vertex to its clamping point to the housing to increase (if within the central thickness) – causing the image distance to the focal plane to increase, thus tending to cancel out the effects of a and b. In the following analysis we assume that stress effects caused by thermal changes are not dominant. This means that that the lens will expand and contract independent of its outer housing. We will first relate to a front clamping of the lens as in the above figure – then we will derive other cases. Substituting for PE: αe = 20x10-5 °C-1, α=6.8E-5 °C-1, dn/dT= -13E-5, Ro=2.77mm, Ct=3.6mm, Wo≈f+Ct. Athermalization could be achieved in theory, although more degrees of freedom may most likely be involved than in the above simplified example. The design should relate to the packaging materials and to the clamping points in addition to the optical design. See Yuval Sharon’s profile at: http://il.linkedin.com/in/ysharon Yuval is one of the owners of CSTM Ltd, a Jerusalem based engineering company, which undertakes projects involving Optics, Mechanics and Electronics. Yuval has earned his B.Sc. (1984) in Electro-Optics from the JCT, and his M.Sc. (1992) from the Hebrew university. Yuval has been working in the industry since1983, and has experience in plastic optics, light sources, diffractive optics, QA, manufacturing, process control and electrochemistry.